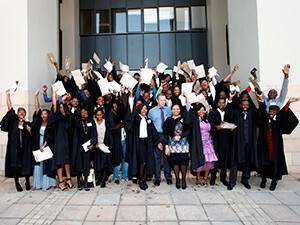 Eighty Gauteng-based students celebrated their graduation from the Get Online project, an ICT skills programme for unemployed youth, in Johannesburg, yesterday. Get Online, a partnership between Microsoft SA, Mentec Foundation and Afrika Tikkun, offers Microsoft Office Specialist and Basic Microsoft Technology Associate training, as well as business and life skills training, and is aimed at unemployed matric or university graduates and unemployed members of under-resourced communities. "The purpose of the training is to upskill, on an individual level, while driving broader impact on employment and entrepreneurship opportunities," said Zoaib Hoosen, MD of Microsoft SA. The programme aims to equip graduates not only with skills but with the ability to teach their skills to others, explained Solly Khoza, CEO of Mentec Foundation. The Get Online project, initiated in September 2014, has successfully trained 300 master trainers to date through the assistance of trainers from 17 community-based organisations in townships and rural communities in all nine provinces of SA, with the hope that these 300 trainers will in turn reach 36 000 beneficiaries within their communities and surrounding areas. Khoza spoke at the graduation, encouraging graduates to apply their new skills to entrepreneurship and community development initiatives, such as starting Internet caf'es within their communities. Afrika Tikkun CEO Marc Lubner echoed Khoza's sentiments, cautioning graduates that "money in and of itself is not a measure of success". Matebogo Nxumalo and Innocentia Khisue, who matriculated in 2013 and 2011 respectively, both hope to use their skills to establish training centres in under-resourced areas. Get Online graduates have not only been employed but started businesses and NGOs, and been involved in government projects, Khoza said. He added that 119 Get Online graduates to date have found employment as result of the programme, which feeds into Mentec's recruitment scheme, Mentec Recruit. The programme and its contents are research-driven, based on requests and advice from industry partners about sought-after skills, said Khoza. Khoza hopes more specialised skills, such as mobile app development and training in business software such as SAP and Oracle, will soon be included in the Get Online programme.